Posted On December 01, 2015 by Team iCynosure. Over the years the bathing bar has lost its shine to more user-friendly and mess-free products like the body washes and shower gels. However, choosing the best cleanser for your body should be on the basis of your skin type and personal preference. Having said that most people believe bathing bars are the best cleansers however they tend to strip the skin’s natural oils and leave the skin dry and dehydrated along with being messy and soggy all the time. This is true for some bars that contain lye but not all. Bathing bars that are infused with natural oils and SPF are perfect for daily use. One such bathing bar that claims to moisturises the skin after each use is the Medimix Ayurvedic Natural Glycerine Bathing Bar. Medimix Ayurvedic Natural Glycerine With Lakshadi Oil contains a unique combination of the purest and finest grade vegetable glycerin and the time-tested Ayurvedic formula of Lakshadi oil to effectively prevent dry skin. When I heard the claims about the brand and the list of nature ingredients I had to try it because I believe in the power of natural and also to give readers a detailed review of it. What is Medimix Ayurvedic Natural Glycerine Bathing Bar all about? Medimix Ayurvedic Bathing bar is infused with Natural Glycerine and Lakshadi Oil that claims to moisturise skin every day. Ayurveda is a system of traditional medicine that is renowned across the world for its ability to heal naturally which is used in this bathing bar to turn an ordinary bath into an Ayurvedic ritual for great skin. As the bathing bar is enriched with Natural Glycerine and pure Lakshadi Oil that moisturises and softens skin naturally, it is not only a great option for winter but also a way to keep your skin soft and supple all year around. What does the ingredient list of Medimix Ayurvedic Natural Glycerine Bathing Bar read like? The ingredients include Lucifer Lacca, Withania Somnifera, Curcuma Longa, Cedrus Deodora, Piper Aurantiacum, Saussure Lappa, Cyprus Rotundus, Tantalum Album, Chonemorpha Fragrans, Picrorrhiza Kurroa, Alpinia Galanga, Anethum Graveolens, Glycyrrhiza Glabra, Curd Water and Cocos Nucifer. How is the Medimix Ayurvedic Natural Glycerine Bathing Bar priced and packaged? The bathing bar is packed in a regular cardboard carton that homes the bar in a transparent plastic bag. Priced at INR 45 for 125g it has a shelf life of 24 months. 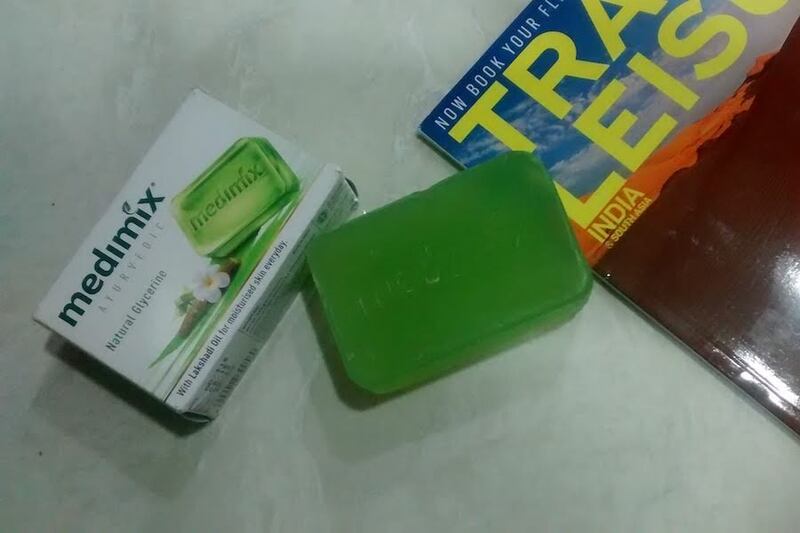 Whats the best way to use Medimix Ayurvedic Natural Glycerine Bathing Bar? The best way to use the bathing bar is to damp it and lather it to cleanse the skin. It is best for external use and perfect to use daily. The bathing bar is a gorgeous mint translucent colour and on first impressions, I love the fragrance. The fragrance is pretty strong which is what I like but the best part is the fragrance subside leaving only a lingering bit. I use it with a loofah as it lathers well and thus it doesn’t get messy or soggy. A single bar lasted around 15 baths over 8 days which is more or less okay as it is glycerin based and tends to run faster than normal bars. On application, it feels really refreshing on the skin and has an immediate cooling effect. It doesn’t feel greasy or sticky which is a common myth for natural oil and glycerine based bars. I love the fact that the bar is mild and gentle on the skin and doesn’t leave it dry and itchy. Another advantage is that it cleanses, smoothens and moisturises the skin so if you hate the after bath beauty regime, this is the perfect solution. Also since it cleanses well it eliminates the outbreak of skin woes like acne, pimples and blemishes. So all in all the bar helps my skin in multiple ways. * Pocket-friendly and lasts well. Will I repurchase/use the product again? Sure. The Medimix Ayurvedic Natural Glycerine Bathing Bar are worth investing in, especially since it works beautifully on the skin. My skin has been smiling ever since and this is now my go-to beauty product for ‘Happy Skin’, the absolutely gorgeous #MedimixNaturalGlycerine. Have you tried Medimix bathing bars or any bathing bars with natural ingredients? Do let me know in the comments; I would love to try them.